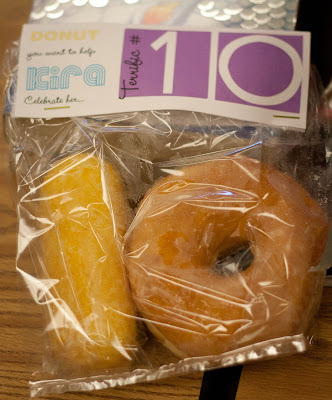 Some of my most Pinned posts are the ones showing creative treats to take to school for hand out at birthdays. Like the juicebox robot, and my recent S’more printable. I’ve also had this #10 donut treat pinned numerous times. 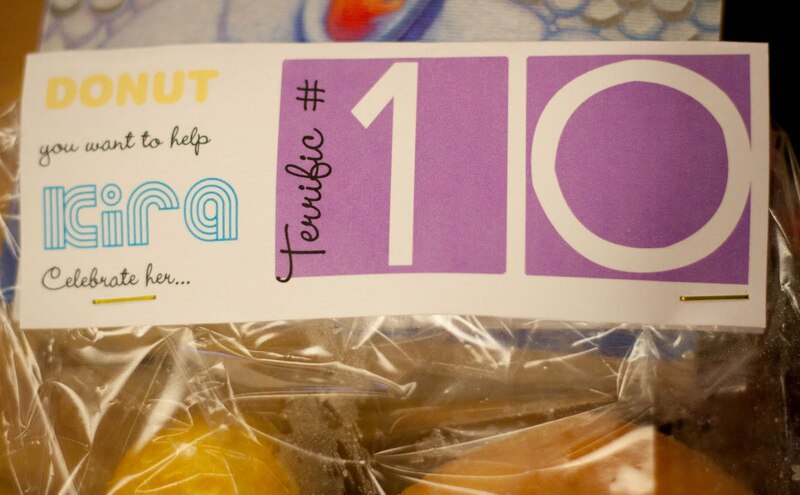 Lately, I’ve had several people request a printable topper that they can download and use to make their own #10 treats. The topper I designed for my daughter’s birthday was personalized so I had to come up with some thing a little different to share with you. I made a generic version in two different color schemes–one more girly and the other more masculine. Click on the image of your choice to bring it up at full-size. Right click to save the image on your computer. You can import it into a Word or Publisher Document, and size and print. Just make sure you leave space on the paper above the image so that you can fold it over to cover the top of your plastic bag and staple. ENJOY! Already have plans for her 11th! Awesome! I can't wait to see you 11! Can you post it before December? I have an almost 11 year old and I always LOVE your ideas! Help…I LOVE this idea. Just printed them and am getting ready to assemble and noticed a minor error. Terrific is spelled incorrectly. Oops. How can I can my download? Is it even possible? Thank you for this awesome idea. Oops! Good catch! I can’t believe no one mentioned it before! Funny I spelled it right on the one I originally made. Do you need them immediately? I’ll fix and post a new one. Is it possible to get a new one posted? I need it in less than 12 hours. See below. I just stuffed, printed and stapled 31 of these for tomorrow. HELP! I don’t know if I’m too late to help you Amy, but I have updated the downloads with out the error. You might just add these on top so you don’t have to re-stuff. Good luck! Thanks, Aimee! Some one caught that a while back but I was in the middle of holiday crazy and haven’t had a chance to fix it yet. Sorry! Just printed and stapled 31 of these and *just* noticed the spelling error. 9:30pm the night before taking them to school. Ohh noo. What to do now? Thanks Kendra. We made these tonight and my daughter is so happy with them. I’m so glad, Tammy! Thanks for letting me know! so cute…I may use this for the 10th day of school!!!! How do I print these to fit a zip lock sandwich bag?